The MFJ-884 is a compact HF/VHF & UHF SWR/Wattmeter with a large 3 inch illuminated cross-needle meters. It reads forward/reflected power and SWR simultaneously. 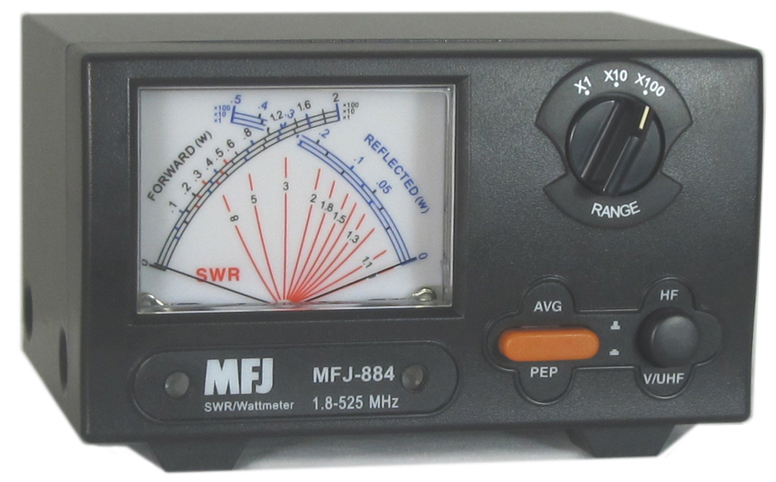 It covers 1.8 to 525 MHz with 2, 20 and 200 Watt ranges. Switchable to read PEP or average power. Has separate HF and VHF/UHF power sensors with SO-239 connectors. Requires 12 VDC or 110 VAC with optional adapter, MFJ-1312D (see below). SO-239 connectors are used for input and output. 5.5 x 3.125 x 5 inches.